G.P. Putnam's Sons Books for Young Readers, 9780525517641, 368pp. The year is 1973. The Watergate hearings are in full swing. The Vietnam War is still raging. And homosexuality is still officially considered a mental illness. In the midst of these trying times is sixteen-year-old Jonathan Collins, a bullied, anxious, asthmatic kid, who aside from an alcoholic father and his sympathetic neighbor and friend Starla, is completely alone. 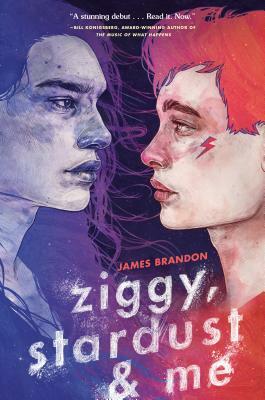 To cope, Jonathan escapes to the safe haven of his imagination, where his hero David Bowie's Ziggy Stardust and dead relatives, including his mother, guide him through the rough terrain of his life. In his alternate reality, Jonathan can be anything: a superhero, an astronaut, Ziggy Stardust, himself, or completely "normal" and not a boy who likes other boys. When he completes his treatments, he will be normal--at least he hopes. But before that can happen, Web stumbles into his life. Web is everything Jonathan wishes he could be: fearless, fearsome and, most importantly, not ashamed of being gay. Jonathan doesn't want to like brooding Web, who has secrets all his own. Jonathan wants nothing more than to be "fixed" once and for all. But he's drawn to Web anyway. Web is the first person in the real world to see Jonathan completely and think he's perfect. Web is a kind of escape Jonathan has never known. For the first time in his life, he may finally feel free enough to love and accept himself as he is.